Last week the temperature outside was well below freezing, the snow arrived but the depth was only a few inches. So I stayed in my workshop, its heated by an industrial wood burner that blows warm air – lovely! 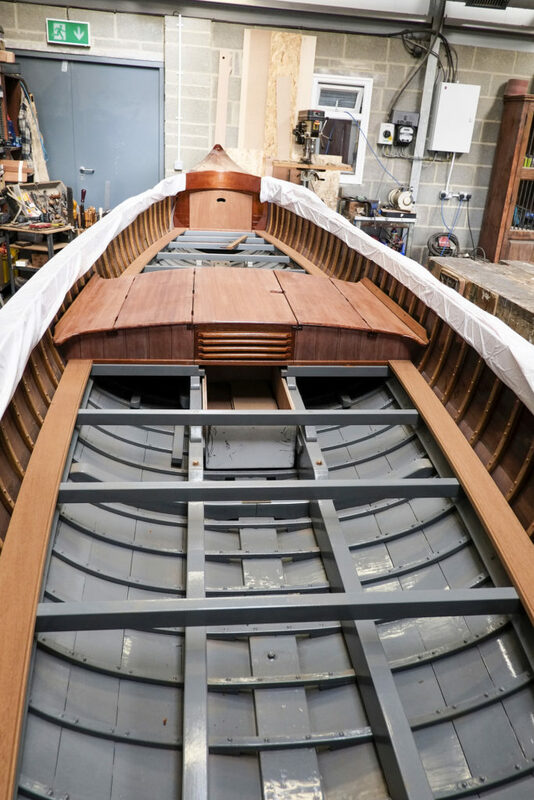 Work on the motor canoe is going well, the central casing over the motor is complete now with its curved Mahogany lids and shaped ends and I am concentrating on the cockpit floors. With the motor casing dividing up the slender cockpit into a forward and aft area there are effectively two floors to make. The design is simple – Mahogany margin boards will frame the floor down either side of each cockpit, these are about 3 inches wide and will have a beaded inside edge. The floor boards will be in Alaskan Yellow Cedar which will provide a contrasting colour to the predominance of dark Mahogany. So today I have been fitting the margin boards using a spilling technique familiar to most boatbuilders, the boards curve around the hull shape and I need to pick off the shape by marking on a roughly fitted piece of MDF with a little marking block against the hull timbers. Next, I place the piece of MDF, called the spilling batten, on the Mahogany plank and reverse the process using the same marking block to accurately set out the shape on the plank that I need to cut to. Simple to do, perhaps not so easy to explain. For the last week I have had the company of my old friend Graeme who, with a bit of help and guidance from me, has been making the mast and bowsprit for his Northumbrian Coble “Avail”. Today, he has started on the new sailing rudder, this is a deep slab of timber that not only steers the boat but provides critical lateral resistance when the boat is going to windward. With a nod to modern rudder design he is giving “Avail” a performance boost with a aerofoil rudder profile, something the original builder would never have thought of!